I have studied, trained and been a sales person for more than 25 years in the interior design industry. I’ve sold amazing product and I was good. If I knew then what I have learned over the years, or if I had sales training instead of solely product training, I believe I could have been great! (1) They have a sound strategy. (2) Always open to improvement and changing what they are currently doing that no longer works to something that does. The great sales person not only sees the goal, but also the road to get there. They have a clear map. They also know that road can be bumpy and they have to put the work in. That road is called a sound strategy. Good sales people THINK they have a strategy, but most I have observed do not. Or it is flawed because many times it’s not based on facts but just what we think. A great sales person has one that based on facts. Even though they constantly remind themselves of the goal, they also get up every day, put those shoes on and take one step to get there. Not thinking faster,easier, or allowing themselves to be be quickly distracted, but one step at a time. They prioritize and have a strategy before they take action. They lay out the steps that they know will get them to the goal. They’re strategists, and keep the course. They laser focus on the goal, but take small, carefully planned steps to get them there. However, great sales people are also constantly making time and looking for improvement. They believe in “Think Different”. They see if something is not working, they don’t just give up. They take time to analyze and seek out ways to improve. Good sales people cannot find the time, they are always far too “busy”. Great sales people may use books or webinars, mentors, coaches or observing what successful people do well. They take the time to learn how to incorporate and implement that into their current efforts. Good ones think they are doing just fine and need none of this. We all know that what brought Apple back from the brink of extinction was Steve Jobs’ THINK DIFFERENT. That is how great sales people think. Most would agree that Michael Jordan was the greatest basketball player of his time. He did not rely on the methods to sink baskets if they did not work. He learned what was not working (failures) and sought out coaching or watched videos or practiced to constantly improve. Six rings later? But do great sales people either completely abandon what they are doing and jump to the next big idea that someone says will make them millionaires. Or do they continue to do what they are doing just to say, I work way too hard for way too little? Oh no, they just take the time to throw away what is not working and incorporate ideas that will work better. 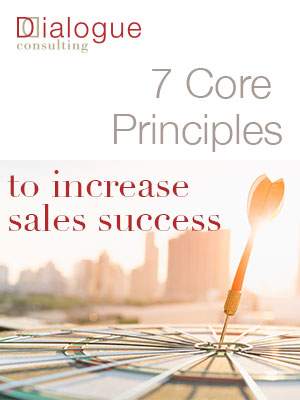 They never look to the “quick fix” or the next new greatest way or method to land sales. They are methodical about just what they think (or know) will improve what they are doing and begin to implement. They certainly don’t give up, they persevere. They understand that it’s for too risky, time consuming and costly to completely give up what they are doing and turn to something new that may or may not work. Of course this is the same for sales people. That’s it! That’s what I have observed and what all the very successful people I read about do to be that GREAT one. It’s not the only things they do, but it’s definitely an important part of their success. That constant quest to do things better every day! So the 80/20 principle works here too. The sales people that have a strong strategy, persevere and are open to change and learning are that 20 percent that excel. What part of the 80/20 do you want to belong to? And, more importantly, what are you willing to do about it? I believe it is in more of us than we think! Deborah Flate started Dialogue Consulting with a vision to make to-the-trade product companies overcome any obstacle that hits them. And with her 25+ years in the industry including the 14 years owning her own business focusing on training, marketing and branding she has achieved that vision. She has been a sought after keynote speaker delivering clear, innovative and powerful techniques to dramatically increase sales at NeoCon, IIDEX, IIFMA, Brentano, Innovations as well as many other venues. She now has a four part webinar based on her ebook: 10 proven strategies that will POWER UP YOUR SALES NOW! You can download the ebook it at Dialogue-Consulting.com and sing up at the top of the page. If you want more information on what works better with sales training or speaking at your sales meetings for product companies or showrooms selling to the trade or to find out how she can help your or your company please log on here, call at 773-281-9448, email me at deborah@dialogue-consulting.com or fill out this contact form for a complimentary strategy session to see if we are a fit and how I can help you. Previous Previous post: Don’t be a pusher. Solutions sell, product does not!